Winter hasn’t felt too wintry yet in much of Australia. Most of us have have had more sunshine, higher temperatures, and less rainfall than is normal for the time of year. In fact, Australia just had its warmest average daytime maximum temperatures for July since records began in 1910. This July saw the warmest average maximum temperatures on record across Australia. The north and centre of the continent saw the biggest temperature anomalies as Western Australia, the Northern Territory and Queensland experienced record warm daytime July temperatures. Only the southwestern tip of Western Australia and western Tasmania had slightly below-average daytime temperatures. Southern Australia was again very dry as the frontal systems that usually bring rain remained further south than usual. Read more: Winter heatwaves are nice … as extreme weather events go. For most of us, warm and dry winter conditions are quite pleasant. But with drought starting to rear its head and a severe bushfire season on the cards, some cooler wetter weather would be helpful to farmers and fire services across the country. What caused the unusual warmth? Often when we have warmer winter weather in Australia it is linked to El Niño conditions in the Pacific or a positive Indian Ocean Dipole. Both of these Pacific and Indian Ocean patterns tend to shift atmospheric pressure patterns in a way that brings more stable conditions and warmer, drier weather to Australia. This year, however, neither El Niño nor the Indian Ocean Dipole is playing a role in the warm weather. The sea surface temperature patterns in the Pacific and Indian Oceans are close to average, so neither of these factors is driving Australia’s record warmth. Another factor that might have influenced the July heat is human-caused climate change. To assess the role of climate change in this event, I used climate model simulations and a standard event-attribution method. I first evaluated the climate models to gauge how well they capture the observed temperatures over Australia during July. I then computed the likelihood of unusually warm July average maximum temperatures across Australia in two groups of climate model simulations: one representing the world of today, and another representing a world without human influences on the climate. I found a very clear signal that human-induced climate change has increased the likelihood of warm July temperatures such as the ones we’ve just experienced. My results suggest that climate change increased the chances of this record July warmth by at least a factor of 12. I also wanted to know if this kind of unusual July warmth over Australia will become more common in future. I looked at climate model projections for the next century, and examined the chances of these warm conditions occurring in periods when global warming is at 1.5℃ and 2℃ above pre-industrial levels (we have had roughly 1℃ of global warming above these levels so far). The 1.5℃ and 2℃ global warming targets were decided in the Paris Agreement, brokered in December 2015. Given that we are aiming to limit global warming to these levels it is vital that we have a good idea of the climate we’re likely to be living in at these levels of warming. I found that even if we manage to limit global warming to 1.5℃ we can expect to experience such July heat (which is record-breaking by today’s standards) in about 28% of winters. At 2℃ of global warming, the chances of warm July temperatures like 2017 are 43% for any given year. More Julys like this are on the way as the globe heats up. Given the benefits of fewer and less intense heat extremes over Australia at lower levels of global warming, there is a clear incentive to try and limit climate change as much as possible. If we can reduce our greenhouse gas emissions and hold global warming to the Paris target levels, we should be able to avoid the kind of unusual warmth we have seen this July becoming the new normal. Parts of the Great Barrier Reef’s outer reefs can form a natural barrier to coastal recession, thus protecting urban centres. Rising sea levels are widely recognised as a threat to coastal communities worldwide. In Australia, the Climate Council estimates that at least A$226 billion of assets and infrastructure will be exposed to inundation if sea levels rise by 1.1 metres. Another report recommended that global mean sea level rise of up to 2.7 metres this century should be considered in planning processes. The Queensland state government has commissioned the QCoast2100 program. This program aims to help with the development of coastal climate adaptation plans for Queensland communities exposed to sea-level rise. Although the largest population centres in Queensland are in the state’s southeast, several of the most populous regional centres in Australia are located along the Great Barrier Reef coastline between Gladstone and Cape York. These include Townsville, Cairns, Gladstone, Mackay and Port Douglas. A major task in developing coastal adaptation plans under the QCoast2100 program is to model inundation from a range of scenarios for sea-level rises and assess how assets will be inundated in the future. However, another threat is on the horizon. Urban centres along the reef’s coastline, which forms the majority of the Queensland coast, are protected from major ocean storms by natural deposits of coastal sediments. These include dunes and associated vegetation such as coastal forests, wetlands and mangrove systems. These natural features continue to exist largely because the Great Barrier Reef’s outer reefs dampen incoming ocean waves. Although exposed to the occasional cyclone – which can lead to short-term erosion at specific locations – much of the coastal zone inside the reef is slowly growing out into the sea. This increasing buffer zone can form a natural barrier to coastal recession. A recently released report estimated the total economic, social and icon asset value of the Great Barrier Reef at A$56 billion. By design, this report did not include many of the ecosystem services the reef provides. One of these is its role in reducing the energy of waves that impact the coastline behind the reef. However, an earlier assessment of the total economic value of ecosystem services delivered by the reef estimated the present coastal protection benefit is worth at least A$10 billion. Despite the inherent uncertainties in such assessments, it is clear the reef acts to reduce incoming wave energy and its impacts on cities and towns along much of the Queensland coastline. The total economic value of these benefits is in the billions of dollars. What role is bleaching playing? The Great Barrier Reef’s ability to keep protecting the Queensland shoreline, and communities living along it, depends upon the ability of individual reefs in the system to grow vertically to “keep up” with rising sea level. The jury is still out on whether the outer reefs will be able to keep up with predicted rises. This is an active area of research. However, it is clear reefs that are extensively affected by coral bleaching will struggle to maintain the essential processes required for productive reef-building. Many reefs are now experiencing net erosion. Predictions of ocean warming suggest that bleaching events will become even more common in coming decades. Increasing levels of atmospheric carbon dioxide are also making the oceans more acidic, which makes it more difficult for organisms such as corals to maintain their skeletons, which are made of calcium carbonate. This mineral dissolves more rapidly with increasing acidification, reducing the reef’s capacity to recover from storm damage and coral bleaching. 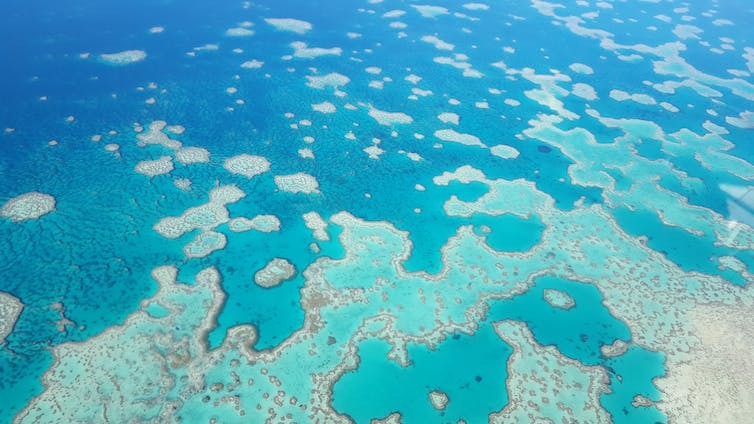 Therefore, as bleaching events and acidification continue, the outer reefs that protect the Queensland coast from ocean waves will increasingly struggle to perform this function. In turn, over time the Queensland coast will potentially suffer from more coastal erosion, which may increase the vulnerability of coastal infrastructure. This effect, combined with rising sea levels leading to more coastal inundation events, multiples the risks to coastal settlements and infrastructure.